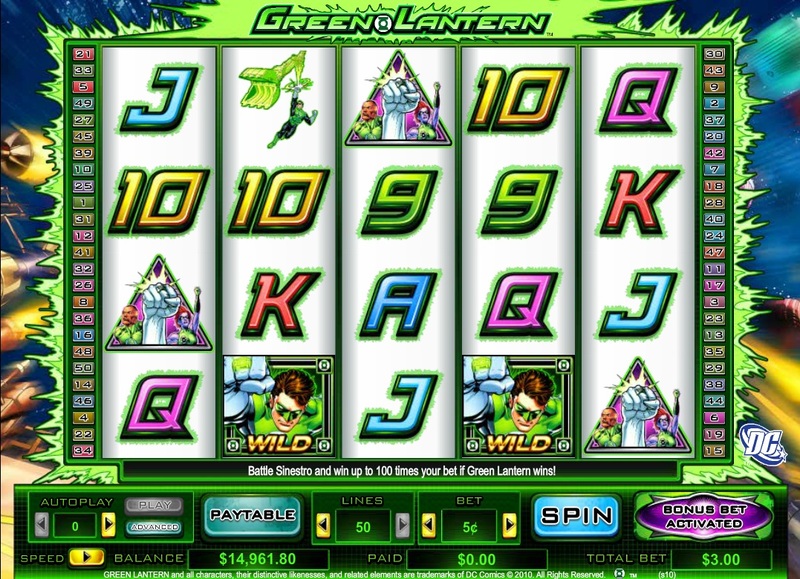 The Green Lantern slot game was released following a deal between slot manufacturer Cryptologic and DC Comics in 2009. It started a trend of comic-themed slots online, which was later followed by the Marvel series released by Cryptologic and more recently by Playtech. Anyone familiar with comic books will have come across the Green Lantern and the power ring, which gives the hero his powers. This ring plays an important part in the Green Lantern slot, as it is the symbol for the scatter, which releases one of the bonuses. For US players, the unfortunate news is that this slot is not available due to laws regarding online gaming. There are two bonus games in the Green Lantern online slot, but only one is available in the normal mode. You need to select the 'bonus bet' to have a chance of activating the ring feature. The bonus bet is essentially playing 50 lines, but betting an extra 10 coins. I can’t see any other benefit to this other than you can play for the ring feature. The first bonus, which gives you 24 free spins, is triggered when there are one or more Wild symbols on Reels 2 and 4 and the battery symbol appears on the center reel. As well as the free spins, each time the battery reappears on the center reel during the feature you will get a wild either side of it, potentially adding extra winning lines. 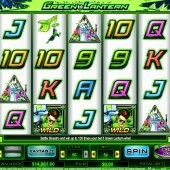 If the Green Lantern Wild symbol forms any winning line then your wins will be multiplied by 4. There are Stacked Wilds on Reels 2 and 4, which can bring in some decent hits if they appear during the bonus. The ring feature bonus is triggered by landing three ring scatters on any of the 5 reels (which can only happen if you have selected bonus bet). The game then enters a new screen and Green Lantern battles it out with Sinestro. In this bonus 100x is achievable, but is very rare. This bonus is significantly less frequent then the free spins bonus in my experience whether you are bonus betting or not. In summary, Green Lantern is a great idea for a slot, but I don’t think Cryptologic have quite got it right. The mixture of old-skool reel sounds with futuristic game noises doesn’t work for me. The bonus bet is confusing and makes me feel a little bit conned. The graphics look dated and not what you would expect for this type of game. The game itself can be rewarding and I have had a few decent hits on this slot, but for the reasons I have just mentioned I play this game very rarely these days.